In addition to sailing Fortuitous all I can, I also crew on a couple race boats. There was a big race this weekend with the Windjammers and we just finished up the season with East End, so I thought I might do a quick racing year in review. No, I did not race in the America’s Cup, but I feel like I should mention it since they just had their dramatic finish. I didn’t want to like it, and I didn’t watch anything leading up to the comeback. I find catamarans ugly and uninspiring. I hate Oracle (the database). I’m turned off by obscenely rich people trying to outspend each other, especially since the technology has advanced to the point where almost nothing could conceivably trickle down to the recreational boater. The AC72s perform at such a ridiculous level that it’s hard to even recognize their tactics, and I find it silly that they can’t race in more than 20kts of wind. All of that said, when Oracle started coming back I felt compelled to watch, and I’ve got to admit that I enjoyed it. Nobody pulls out 7 must-win victories in a row to clinch a championship. This brand of racing is barely related to “real” sailboat racing, but there are recognizable aspects: sticking to the side of the course with favorable current or wind can win you a race, and flubbing a jibe or getting burned at the start can lose it. Watching the evolution of the start tactics as they got more comfortable with the boats and did more close-quarter sparring was also interesting to me. And despite the absurd price tag, they are amazing machines. Most of the powerboats where I sail can’t go 40kts. I don’t think it’s going to catch on, and I would still rather see them sail 12m one-design yachts, but it was a fun ride nonetheless, even if I had to hold my nose at the thought of a robber baron winning the best sailing trophy that money can buy. I did race with the East End Yacht Club, which is pretty much the polar opposite of America’s Cup racing. The EEYC is a dedicated racing club. It’s not associated with a marina and there is no clubhouse, although we do have a shed in Burlington and we’re able to borrow the Anchor Yacht Club in Bristol from time to time to hold meetings. We mostly just show up in a designated spot on the Delaware River on Tuesday nights to race. I crewed again on Revolution, Sailor Steve’s Capri 25, and I think we had our best year since moving up from the less-competitive cruising fleet. We had our first 1st place finish this year and were competitive in most races, especially as the season went on, despite being shorthanded most of the time (usually just me and Sailor Steve). We finished 4th and 5th overall in the spring and summer series, which is a big step up for us. Our boat speed was much better in general this season, and I think we’re just starting to understand how to handle the current, which is pretty important when racing in a fork on a tidal river—current is sometimes the primary means of locomotion there. Our last race of the season was, of course, called off midway through for lack of wind. It gets dark earlier this time of year and as all of the other boats fired up their motors and bailed out, Steve and I turned on the running lights and continued to drift toward the finish line like the character in the Cake song, not quite ready to let it go. There are a couple weekend races in the fall that we might try to make, but we’ll be waiting until spring for the next regatta. I’m looking forward to continued improvement and maybe some new weapons in the sail arsenal next year. The Windjammers Sailing Club is our club at the shore. While racing was historically a big deal, over time the club has become more focused on organizing cruises and dock parties. 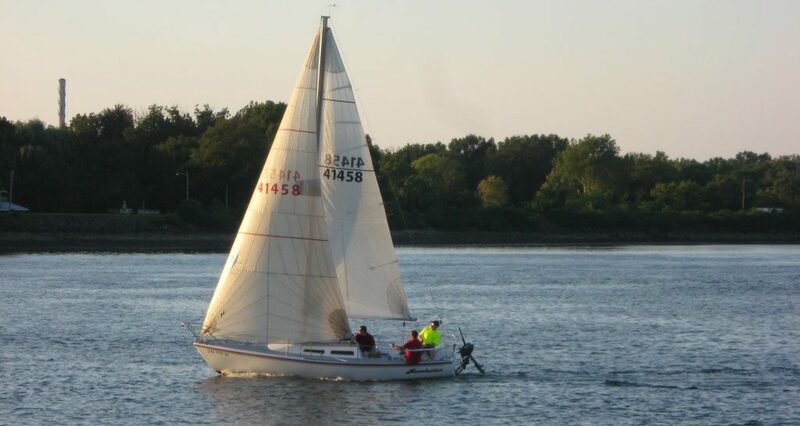 We still have races though, including an annual race where we compete against the Tall Oaks Yacht Club of Forked River, which we have not won since I’ve been a member. I raced in the Tall Oaks Challenge with Val on Providence II this weekend. I don’t want to overstate my role in this, but I got pretty cranky at last year’s winter meeting about the state of racing in the club. My role as Webmaster gives me a seat at the table, and when the subject of racing came up I tried to throw out a few ideas to get more people back into it. No one was onboard with my idea of making glittery posters to vilify Tall Oaks in the weeks leading up to the race, as if they were the rival high school in some kind of nightmare “school spirit” scenario. They did, however, agree to hold a practice race just before the Tall Oaks race, which included meetings to discuss tactics, several short races, and (perhaps most importantly) provided a structured way for skippers to gather crew and get them familiar with the boats before sailing out to the course on race day. I don’t know if that helped, or if it was just dumb luck, or if we caught Tall Oaks resting on their string of recent victories, but WE WON. The Tall Oaks Challenge Cup is now back in the Windjammers’ hands and I personally hoisted it in victory. I would have drunk alcohol from it if the cup portion wasn’t capped by a brass-colored sailboat, greatly reducing its effectiveness as a cup. I would write up a report of how the race went for us, but there isn’t a whole lot to say. We ran an extremely tight and efficient race, and there was never a time after the first few seconds that we weren’t in the lead. We finished something like 12 minutes ahead of the second place boat, which was more than enough to cover the PHRF handicap. The more important point was that the second place boat was a Windjammer, as were the third and fifth place boats, and that is how you win the challenge cup. With Providence II, Sashay, Sunset, and Tiki all finishing in the top 5 (there were 15 boats total, 8 WJ and 7 TOYC) we were pretty much guaranteed the victory as a club. I know that probably no one cares about this as much as I do but I’m really proud that the club came together and got this done. I hear in all sorts of circles that sailing is on the decline—that the old guard is getting older and that young people aren’t getting into it fast enough to replace them and so on. I chalk a lot of that up to nostalgia and I’m not sure that the numbers bear it out, but when my club’s quantifiable racing performance and age demographics start to match up with the laments of the old timers (and the full-time whiners on the sailing forums), it’s only human nature to ponder the pattern. It feels good to win. It couldn’t have been done with a single fast boat or a lone great skipper or one well-honed crew. It had to be a club-wide effort, and it represents the kind of camaraderie and mutual dedication that I want from a club, even though (or perhaps especially since) that kind of team stuff doesn’t come easily for me. I personally got a big boost from this, and I’m hoping that others will be equally inspired. I’m not really a racer at heart, but for whatever reason I tend to equate sailing fast with sailing well. If all you want to do is be on the water, drink some beers, and work on your tan, it’s way easier in a powerboat. Part of the allure of sailing is that it’s difficult to truly master. You can do it your whole life and continually learn and improve. Racing is a way of practicing the art of sailing well, in a way that gives you much more feedback than if you were just reaching up and down the bay with a Mai Tai. I think it’s made me a better sailor, and I greatly appreciate all the time I get to spend on other people’s boats, trying to make them go just a little bit faster. Thanks for all your hard work trimming this year, for doubling as strategist, and most of all for being there every week. I’m proud of our improvement this year, and hope you are too. Can’t wait for next season. Yeah, we've definitely improved a lot. We should be even better next year. I wish we were racing tonight…it's really nice out.